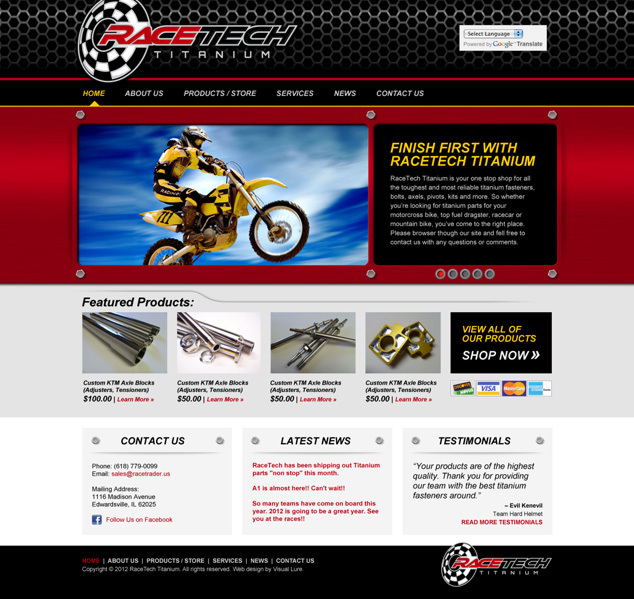 Visual Lure was recently contracted to design a logo and website for RaceTech Titanium, an Edwardsville, IL based company that sells Titanium fasteners for motorcycles, race cars, dragster, mountain bikes and more. The final logo is show below, the large logo on top, along with some of our other logo design options. Since the mass majority of their clients are in some type of racing industry, the logo design they chose features a “finish flag” in the circular motion in which it is waved at the end of a race. We are also in the process of designing a new website design which will be built using two platforms. We will be using WordPress for the information sections of the website and ZenCart for the online e-commerce store. Below is our initial design for the home page. Check back soon for the launch of the new website.